If you want to start walking your dog every day it comes down to getting motivated and making it a habit. Remember that walking isn’t just good exercise for you and your dog, it’s important to your dogs overall well being. Here’s a list of 10 dog walking tips that will make your walks more enjoyable for both you and your dog. 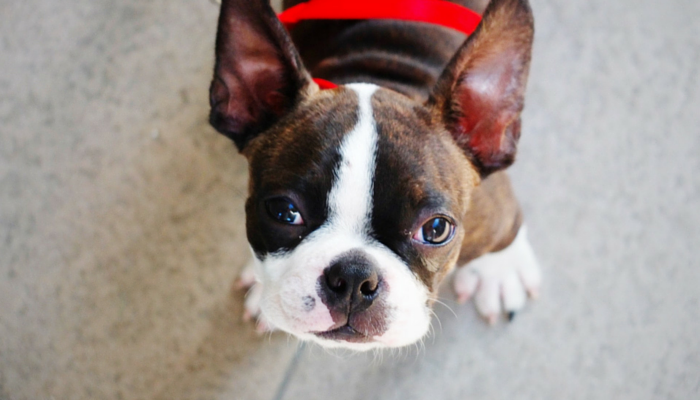 Does your dog constantly pull on leash? Try using a front clip harness. Dog collars and harnesses that clip on the back actually promote more pulling. Figuring that out was a major Aha! moment, and I’m still not sure why it took me so many years to figure out. As you can see below we used to have a lot of problems with pulling. Why it took me so long to realize that our back clip harness was promoting more pulling I’ll never know. Getting a front clip harness is the best investment I’ve made when it comes to making walks easier, even better than my favorite pair of sneakers. Just be sure to check for a clip on the front when shopping for a harness. My local pet store had about 10 harnesses, but they were all single back clip ones. I ended up going with the Easy Walk harness from amazon and it’s been working great. If you want a harness that will help keep your dog from pulling just be sure to search for “front clip” options. Keep in mind that the right harness won’t solve everything. 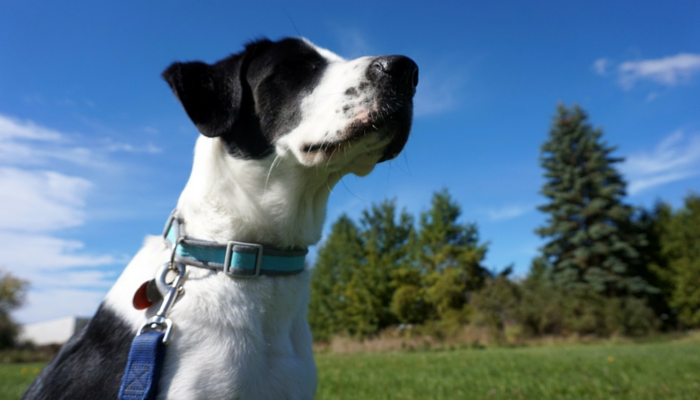 You still need to devote time to training your dog to walk nicely, so here’s an awesome loose leash walking guide that will help get you started. As soon as we switched to a front clip harness Laika’s pulling stopped. I’m still surprised at how much of a difference one piece of gear can make. 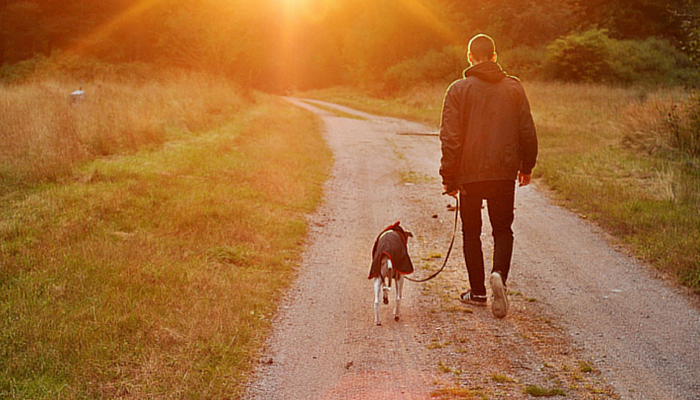 Did you know dog walks are about more than just physical exercise? Your dogs walk is (usually) the only time they get to go out and explore each day. Give them a little extra time to sniff around. If you don’t want to stop every 5 seconds or have you dog sniffing around in your neighbors yard that’s fine. You decide which areas are appropriate (and safe) for them to explore. When you want to give your dog a little sniff break just loosen your dogs leash for a few minutes and give them a chance to take in all those smells. I use a “go smell” cue for Laika, and a “let’s walk” cue for when it’s time to move on. 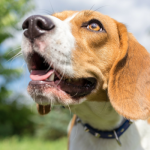 All those smells provide your dog with stimulation and information, it’s their way of keeping track of what’s going on in the neighborhood. And you’d be surprised at how exhausting a nice ‘sniffer’ walk can be for your dog compared to a brisk 15 minute one around the neighborhood with no sniff breaks. We often focus on just the physical aspect of walking, but keep in mind that extra mental stimulation your dog gets from sniffing really adds up. Some scientists argue that we’re doing a disservice to our animals by not acknowledging the importance of smell for their well being. You can make walks more meaningful & enriching to your dog just by giving them a few extra minutes to sniff around. 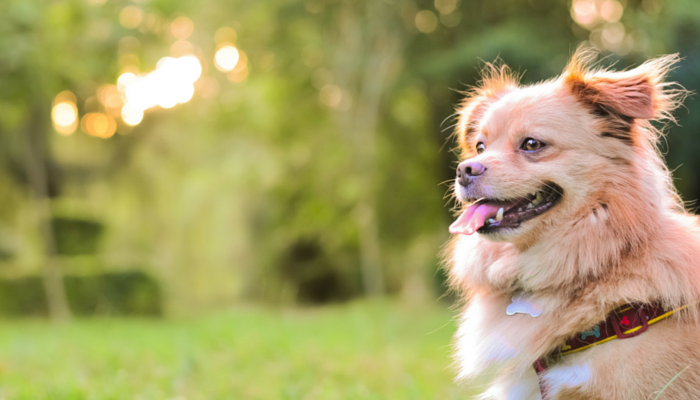 You can give your dog more enrichment by letting them sniff around on walks. When it comes to using the right leash for your dog walk I have one recommendation: avoid retractable leashes. 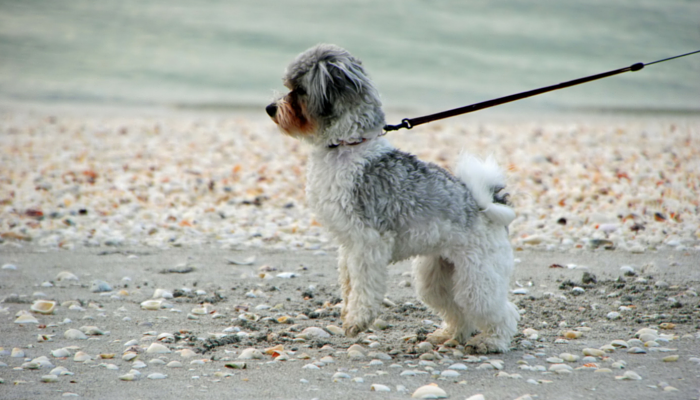 Retractable leashes cause many unnecessary hazards compared to traditional leashes. The length of most retractable leashes makes it difficult for you to maintain control of your dog, especially in high traffic areas. 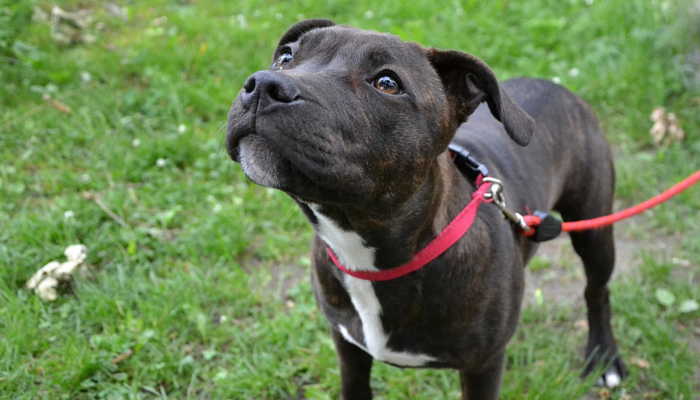 Dogs can easily run into the street, and those leashes are not easy to reel in. And those locks on retractable leashes? Well they’re known to disengage with enough pressure. 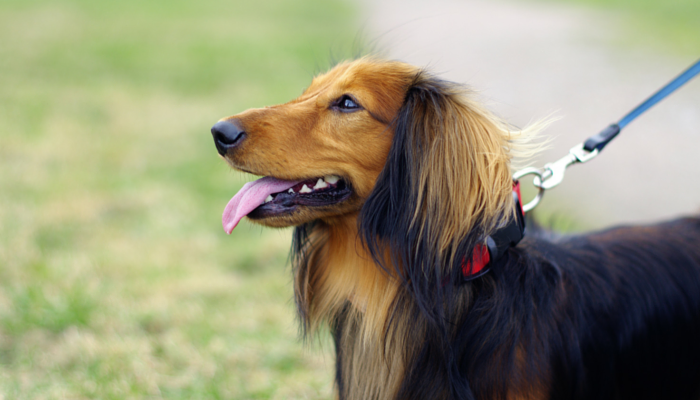 Retractable leashes are also known for causing injuries to dogs and humans. Grabbing onto the leash itself for more support while your dog is moving can cause severe burns (and in extreme cases digit amputation). And when your dog reaches the end of the leash that sudden jerk can cause you to fall over, and it can cause serious injuries to your dog. If your dog already pulls while walking a retractable leash will only it worse. Why would he stop? He’s being rewarded with more freedom every time he pulls. Retractable leashes are a poor choice for normal walks, but I will admit that in certain situations (like the beach or potty breaks in the yard) they are convenient. Just make sure to stick to your normal leash when walking your dog in any area with traffic. It’s much easier to keep control of your dog (especially when they’re pulling) by using a traditional leash rather then retractable one. Another dog walking tip to remember — pick up your dogs poop. Picking up your dogs poop is more than just being a good, tidy neighbor. 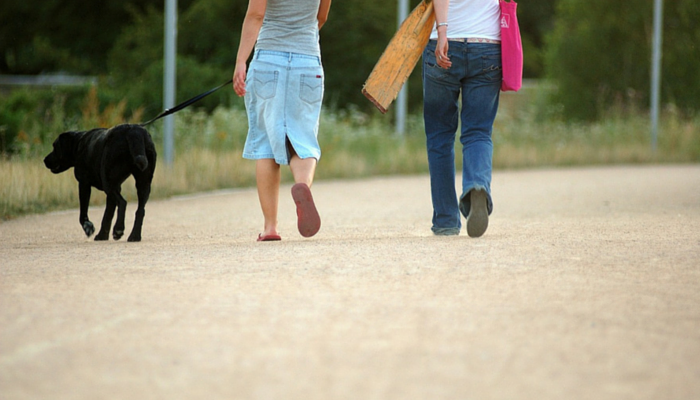 Dog poop that isn’t picked up causes major health concerns to humans and pets alike. Pet waste may contain harmful organisms such as giardia, E. coli, roundworms, hookworms, and salmonella that can spread to other animals and humans. And when pet waste is left on the ground those diseases, pathogens & bacteria make their way into the soil and pollute water supply. And these nasty organisms can live a long time in the ground. Hookworm larvae, for example, can live for several weeks in the soil. Studies have found that 20-30% of the bacteria in urban watersheds is due to dog waste. I understand that picking up poop isn’t glamorous, but it’s part of being a responsible pet owner. It’s not just rude to leave your dogs poop laying around, it’s a potential health hazard. You can buy poop bags in any pet store, and they’re really easy to carry. Just shove a couple bags in your pocket before heading out, and if your dog gets a little poop happy on walks (are there actually dogs that don’t poop a lot on walks?) be sure to bring a few extras. If you’re going to be walking for more than a half hour or out in the hot weather bring plenty of water along for your dog. 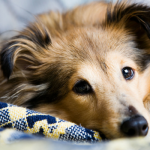 Dog’s have a harder time regulating their temperature than we do, and it’s easy for them to overheat. And since dogs sweat through panting they can easily become dehydrated during exercise, especially in warm weather. 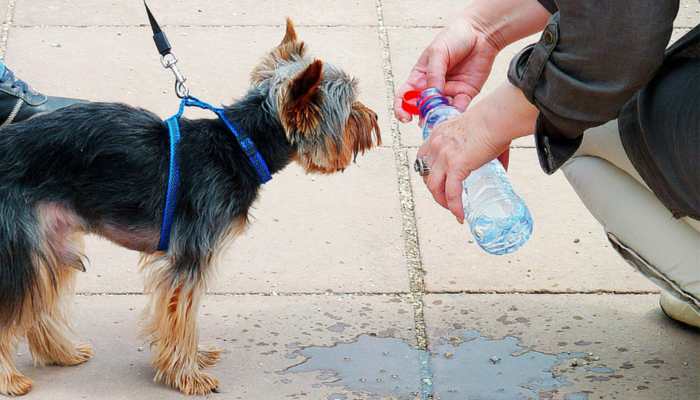 Don’t forget to bring water along for your dog, especially in hot weather. Every time you leave the house with your dog ensure that they’re wearing ID tags. Unfortunately you can’t control everything that happens, and sometimes dogs get lost. Be prepared by making sure your dog is wearing tags that are up to date. (I use a personalized collar with our phone number as well since we’ve lost plenty of tags over the years) And since collars can break or be wriggled out of talk to your vet about getting a microchip. If you get a microchip for your dog be sure to register your information. As long as your information is current anyone who scans your dog for a chip can get in touch with you. If you’ve seen those stories in the news about dogs being lost for months & turning up hundreds of miles away they’re almost always reunited because of a microchip. Make sure your dog is wearing proper identification before heading out on your walk. Wanna know if the pavement is too hot for your dog? Place your hand or barefoot on the pavement for 5 seconds. If it’s too hot (or uncomfortable) for your skin it’s too hot for your dogs feet. And hot pavement isn’t just uncomfortable, it can cause serious injuries to your dogs paws. On those really hot days you can walk in the grass, go to the park, or walk in the woods. If your dog is pretty tolerant you can even get them some booties to help protect their paws. (Laika is not tolerant of booties, we stick to the grass on hot days) You could also walk earlier in the morning or evening stroll to avoid the hot sun. You can avoid hot pavement by walking in the woods, on dirt roads, or walking your dog during the evening. No matter where you walk there’s going to be distractions. If your dog is like mine every single squirrel sighting becomes a major event. In those “oh crap” situations keep your dogs attention by having some high value treats on hand. And if you’re cheap like me don’t worry – you don’t have to use store bought treats. You can make your own healthy DIY dog treats or use some fruits & veggies that you’ve already got on hand. My dog goes crazy for carrots so I have it easy, but not all dogs find veggies that appealing. Chopped up meat is almost guaranteed to get any dogs attention. Bring some high value treats on walks to grab your dogs attention when needed. Just because your dog is friendly doesn’t mean every dog to dog meeting will be pleasant. Avoid any unnecessary risk by asking before letting your dog approach another dog. Not all dogs are dog-friendly, and there’s plenty of dogs that don’t do well with on leash greetings. So if you run into anyone else walking their dog please ask permission before approaching them. If your dog is the one that’s reactive and doesn’t do well meeting other dogs check out these 10 tips for walking reactive dogs. Keep your dog safe: always ask other owners before approaching their dog. If you’ve driven at night before I’m sure you’ve had plenty of “oh crap” moments. Those times when you almost hit someone walking on the side of the road due to poor visibility. Don’t be that guy. If you don’t have sidewalks in your neighborhood make sure you give drivers the ability to see you from a distance. For the safety of you and your dog get wear something reflective if you walk at night. And if the majority of your walks are during the evening you can get a reflective collar/leash combo for your dog as well. If you walk during the evening wear reflective gear for more visibility. Do you have any additional dog walking tips? Do you let your dog sniff around on walks? Let me know in the comments below. There’s always plenty of sniffing time on walks! Mr. N always wears his collar with a tag and I carry high value treats to work on reactivity. We let our dogs sniff around on walks, but we try not to let them get obsessive about it. As far as walking tips we started Archer out by walking backwards with him to teach him a good loose leash heel. It was different way for us teaching heel, but it’s been effective. Great tips! I always let Nola do whatever she wants (within reason; so long as she’s not pulling hard or trying to bother any neighborhood cats), and then take a section to train once her excitement levels have evened out. Fabulous tips! Boca and Laika have the same Freedom harness (I also just got her another one in the teal color – girl needs a wardrobe for BlogPaws). I have a special needs dog who who was horribly abused as a puppy and used in a fighting ring as a tortured dog by some inhuman monster I would like to see unspeakable things done too. Anyways the reason I bring this up is to drive home the point that even good dogs like her can be afraid of certain breed at what seem like at random. IT is NOT her fault given her haunted past, BUT she need to not be randomly approached by strangers so I wanted to emphasize your point about not assuming every dog is dog friendly even if they are people friendly. My dog is super people friendly. Good topic! I will have to give a front clip harness a try! We are using no-choke harness for my Yorkies because they are prone to collapsed trachea. I find when walking multiple dogs Retractile leashes are helpful. HOWEVER, You need to shorten them down to 6-8 ft and not a bit longer!!! Locks are for you to hold down for the time you need to control the dog. And they are easier when you need to grab that dog and pick them up. Been doing this for more than 12 years now. I think I am a pretty good trainer in most areas, but my walking skills are lacking. It is really helpful to read an article like this because I have a much better understanding of what I am doing wrong. Choosing a traditional leash over a retractable one should be east enough, so I will be sure to do that. Thank you for all of you applicable dog walking tips! My Cavapoo, Tilly. is 5 months old and we are attending puppy foundation course. The trainer insists on us using a back ring harness. However, whilst Tilly is good in the close environs of our garden and the training room she is very unpredictable when outside. She will either pull on the lead or refuse to walk at all and just sit down ~She loves people and other things and pulls to get to them. Treats In my hand do not distract her. When she is nervous at noises she will just refuse to walk and ” anchors on”, again, treats wont help. Please can you advise me . It sounds like Tilly might need some smaller steps to start building up her confidence (in regard to being nervous at noises). Once she’s at the point of anchoring on or refusing to walk it’ll be hard to really reach her at that point. I don’t know if it would be possible to start trying to desensitize her before she gets to that point of over nervousness since it sounds like it’s fear based and there’s not usually a good way to predict those. If possible though I’d try giving her treats before she gets up the to scary object or sound – she’ll eventually start to associate those scary things with positive outcomes. If your dog is a little too playful or pushy with other dogs I’d work on some impulse control & desensitization techniques. 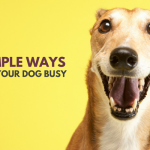 For impulse control I’d start at home; teach your dog to ‘look at me’ or ‘pay attention’ until your confident that you have a pretty good handle on getting your dogs attention. 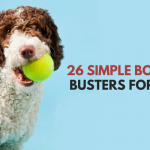 Of course doing that at the dog park or out on a walk will be more of a challenge, but practicing in different environments will help build up his focus. And as far as desensitization your goal is to turn your dogs reaction when he sees other dogs from the excited must play attitude into a more calm behavior. Basically you want to expose your dog to another new & exciting dog, but in a slow manner until he’s able to remain calm. And then you repeat that practice many times until he begins acting calm when faced with any new dog. I recently had back surgery and the Doctor wants me to start walking, building up to 2 miles a day. I have a female Terrier mix, 2 yrs old / 7 pounds that I walk a couple of city blocks twice a day…Is 2 miles too much for a dog this small? Hi, my name is Park and I am a cattle dog cross, I like my human not talking on her phone, be in the moment. Check out my blog whenparkspeaks. Great points in this article. As I mention in the article back clip harnesses promote pulling, but front clip harnesses do not. I like to vary our route so my dog is mentally challenged every day with new experiences. He has favorite places to go so I change it up. I live is the Sonoran Desert and our roads are chip sealed. There are weeds and high grass on each side of the one lane road I walk with my 6 month old Boarder Collie. He has had his snake training but so far we have not come across a snake on our walks. I choose not to let him explore the grass along the side of the road as I don’t need to find out what he would do when meeting one. We walk the center of the road, early in the mornings so the ground isn’t hot. I carry water and mini carrots. Taking walks in the desert is not the same as walking in the city. Great points, and I agree completely that walks in the desert are completely different. If I lived there I wouldn’t let Laika sniff along the roads either, I certainly wouldn’t want to find out what she’d do if she ran into a snake. My family and I have recently adopted a dog and we’ve been using the dog as a tool to help teach our son about responsibility. I liked that you had mentioned that when walking your dog it is very important to clean up after them to avoid getting humans and other animals sick. Once he starts taking her for walks, we’ll be making sure that he cleans up after her, but I might have to look into buying a pooper scooper to help him with the cleanup. I like to bring an old towel washed in unscented detergent along on our puppy walks. I attach it to a piece of lightweight rope and drag it along the ground as we walk! When we get home I drag another one attached to me. The 2nd one picks up our home scents. It works wonders when we take our dog to the vet or a new place that might make them nervous. They can sit with it. When we take one with us on our walks after we get home they can relive the new smells. They always return to their own home smells towel. I do a dog walking business in soeul South Korea and this will be very help full thank’s???????????? I think the worst thing about retractable leashes is if you’re not paying attention and your dog sees something that catches its attention (SQUIRREL!) they can run off with enough acceleration to slip the handle from your hands. I’ve seen it happen enough to know it’s a bad idea. My favorite way is using a front-clip harness, and putting on a waist belt (on myself), and clipping the leash to that. My dogs aren’t going anywhere without me. If a dog is pulling on the leash that is a dominance issue, and by letting him sniff around as much as he wants will allow him to take complete control of the walk. Walking time isn’t just for exercise, it is one of the best ways to show dominance without ANY form of abuse. If you see someone with their chihuahua walking out in front, you should probably find it hilarious as that means the owner is dominated by a chihuahua. Thank you for the suggestions. I have a 15 month old chocolate lab. She is a lovely, friendly girl but walking her has been a nightmare! Cassie weighs 67 lbs. She has dragged me to the ground more than once and I have neck and shoulder problems as well. I basically had to stop walking her due to injuring myself. I have recently purchased a front lead harness. One problem … she still insists on pulling and now she walks sideways instead of straight! Maybe I need to let her have some sniff the ground time … might make a difference. And as far as the sniff breaks are concerned they’re not a bad idea, I just think it might be easier to focus on teaching your dog not to pull first. When you do decide to try some sniff time just make sure you use a cue with it such as “go sniff” when it’s OK to go explore and “let’s go” when it’s time to leave. Using those cues should help alleviate any confusion as to when it’s OK to follow her nose versus when she’s supposed to be following your lead. Wow, I like the idea of using a reflective collar/leash combo for my dog during night walks. While my dog hasn’t been trained yet, it is nice to be informed about these things beforehand. I will be looking into pet training facilities to further train my dog while I am not at home so that Buck will not be bored while waiting for me. Thanks for the tips! BTW, thanks a lot for sharing such an informative post. Good information. Such an informative post you share that give me a proper guideline for my life easy. Thanks for this perfect blog post. Another tip, bring your cell phone with you. In case of emergency and you need to place a call, not for idle chatter. I felt scared when you said that leaving dog poop lying around can increase a community’s chance of contaminating nearby ponds, lakes, rivers, and drinking water. When you suggested getting a waste bag, it convinced me to buy a large mesh bag for my Rottweiler. That way, we can both get exercise and avoid polluting in and around our streets at the same time. To ensure that your dog can walk on any terrain without any difficulties, you can start them by giving basic training, play with them on regular basis, take them out for walk every day and teach them command on how to act on tough terrains. Hi Jen! Very good and wise advice. But one big problem is dealing with unleashed dogs and their bully owners. My niece’s Yorkie was mauled to death by a Pitbull and the owner was only amused. Be prepared for the unthinkable because it happens more often than you think; even on Judge Judy, probably 25% of the cases are dog attacks. I recommend a pointed hiking stick. Sorry if you think I’m paranoid but once this happens to you, you will always be on guard.